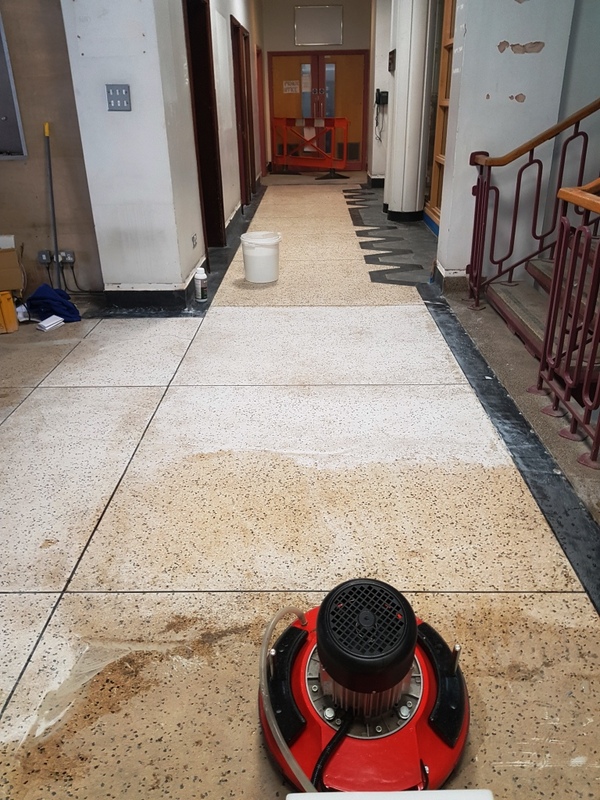 Last summer I was asked to carry out a survey at one of the Cardiff University buildings where they were looking at having a large Terrazzo floor restored. The University was on its summer recess so with no students around it was an ideal time for major works to be carried out. At some point in the past the whole floor had been covered in a layer of self-levelling compound ranging from 2mm – 10mm thickness, so it could be covered with square carpet tiles which had then been secured with adhesive. You can still see the outlines of the tiles in the pictures below. It’s hard to appreciate from the photo that underneath there’s a beautiful Terrazzo floor waiting to be rediscovered. 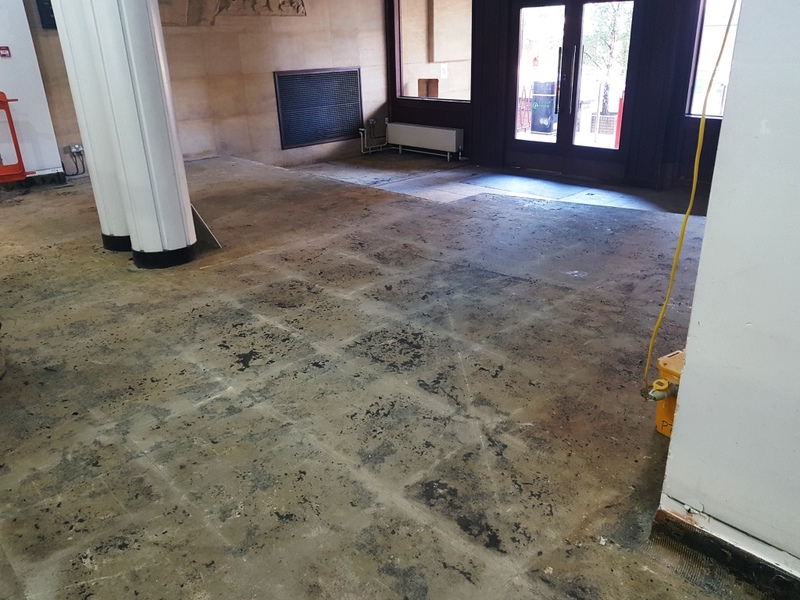 The University had removed the carpet tiles but were unsure of how to remove the screed without damaging the Terrazzo underneath and so asked me to quote for restoring the whole floor. I carried out a test clean on the floor first to show the architect’s and university staff an example of what could be achieved. The method I used for the test sample was to use a process called milling with a 50 grit Milling Pad, which I used to grind off the levelling compound until the stone became visible underneath. The test clean took me a good hour to complete but the results I achieved proved very satisfying both to myself and the clients and I was awarded with the contract. On commencement of the work I realised after 4 hours of milling that this method although effective was very time consuming and extremely messy! So, I tried using a long handheld sharp scraper which turned out to be a lot faster and cleaner in removing the cemented compound. In the end it took four days for two men and a great deal of hand ache to remove the screed for the floor. 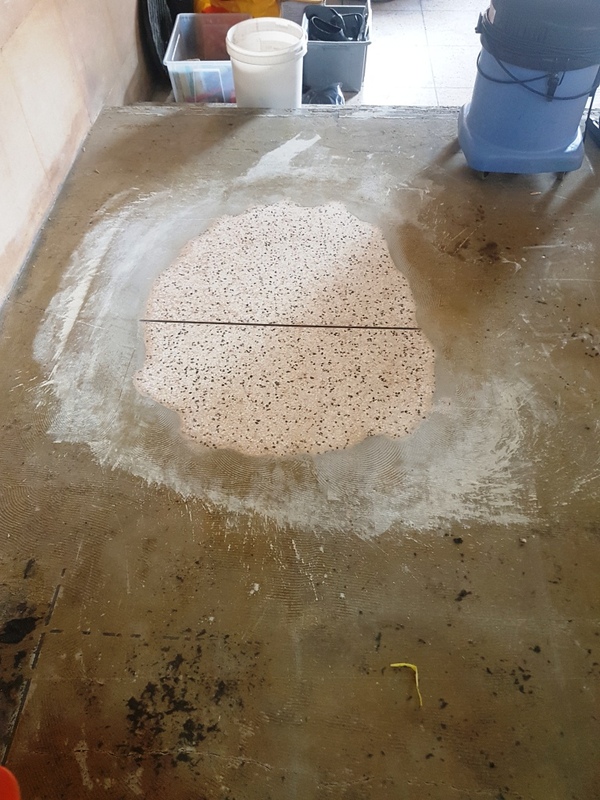 After removing the compound, I started milling the floor with a Tile Doctor Milling Pads, first the 50 segment & then a 200-segment pad to cut deep in to the floor to remove the stains in the Terrazzo and scratches from using the scraper. This was followed by burnishing the stone with a set of four Tile Doctor Burnishing Pads. 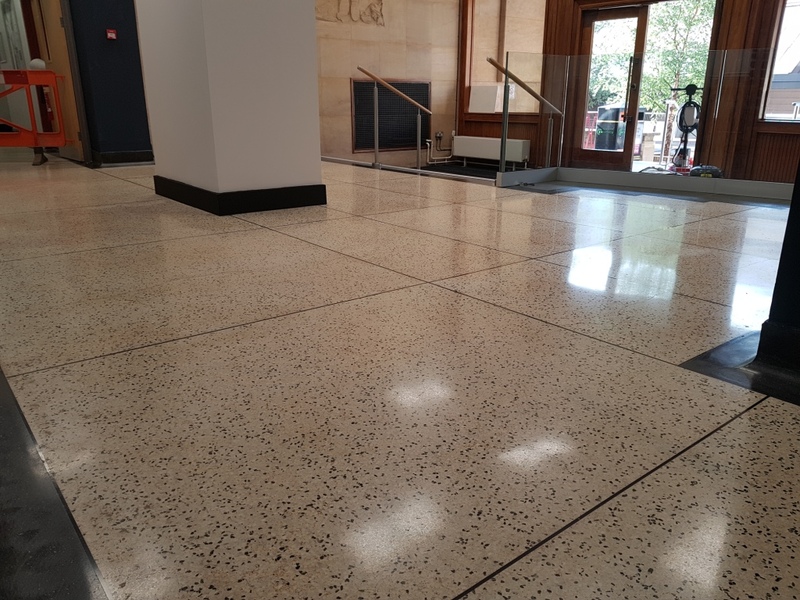 This involves the application of four pads in sequence from a coarse 400 grit through to a very fine 3000 grit to refine the surface of the Terrazzo and improve the lustre of the floor with each grade of pad. The architect had specified a hardwearing finish as this was a very busy entrance way for students entering the buildings. So, after finishing the burnishing of the floor with a very fine 3000 grit pad I sealed the floor with three coats of Tile Doctor Colour Grow which seeps into the pores of the Terrazzo protecting it from within enhancing the colours of the chippings in the process whilst providing maximum protection. Finally, we polished the floor after sealing with another application of the 3000 pad and a polishing cloth to shine the floor further. 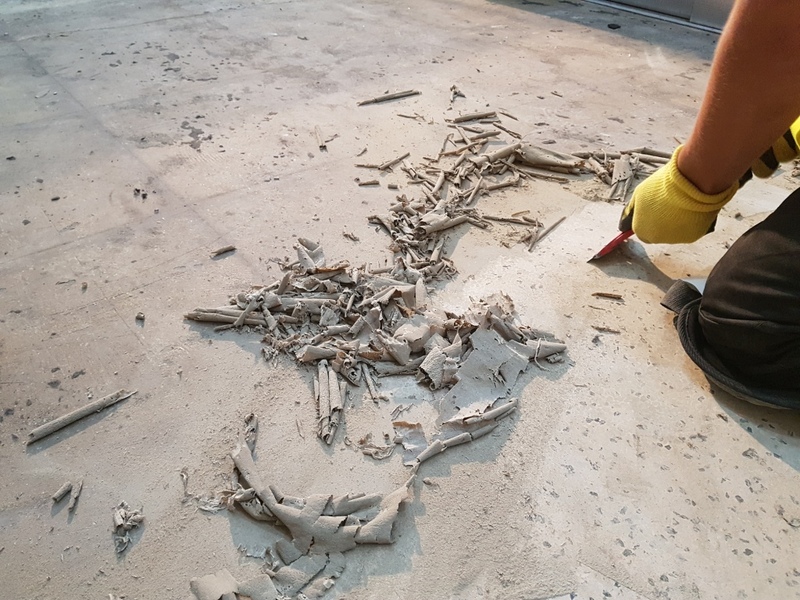 It was a large floor, so I managed the project in sections, and this enabled me to start on the cleaning of a new section whilst the floor was drying in the previous section. As you can see from the pictures the floor was transformed and looked great. Needless to say the University were very happy with the result. 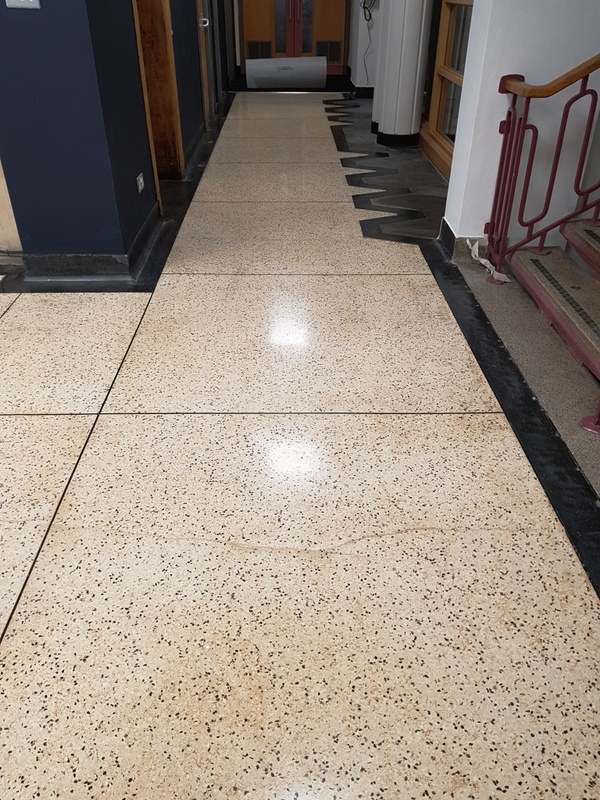 This entry was posted in adhesive removal, Cardiff University, carpet tiles, commercial floor restoration, Screed Removal, self-levelling compound, South East Wales, Terrazzo Floor Tiles, Terrazzo Restoration, Tile Cleaning Activities, Work History by TileProf. Bookmark the permalink.